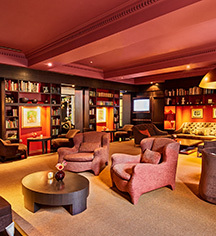 Sofitel Legend The Grand Amsterdam possesses a rich history that dates back to the 1500s. Over the centuries, the buildings that now constitute the hotel have been at different times convents, residences for European royalty, and the headquarters for the Dutch Admiralty. More recently, the buildings served as the City Hall in Amsterdam for close to 180 years. But in 1988, city officials decided to relocate City Hall back to Dam Square, leaving the buildings completely vacant. Sofitel acquired the abandoned site several years later, converting the location into the premiere hotel, The Grand Amsterdam. Since 1992, Sofitel has owned and operated the hotel, elevating it to its prestigious Legend brand in 2011. The Grand celebrated its 25th anniversary during 2017, in which the hotel had won a record number of awards for its extraordinary hospitality. Today, The Grand hosts 177 guestrooms and 52 luxury suites. During the most recent renovation, students from the Design Academy of Eindhoven incorporated the historical aspects of the building’s past into the designs for the hotel’s new lodgings. The result was a harmonious blend of traditional and contemporary Dutch style within every space. Architects and designers ensured that they provided guests with the most modern accommodations without having to sacrifice the site’s special historical heritage. Sofitel Legend The Grand Amsterdam also features two award-winning restaurants, Bridges Dining and Bridges BarBistro, as well as various bars scattered throughout the hotel. Inside the complex is the renowned SoSPA, which includes a heated indoor pool, sauna, and fitness area. Many landmarks within the city are close to the hotel, making The Grand the ideal starting point for anyone interested in exploring the city. Guests can learn about Dutch history by visiting the Royal Palace, the Anne Frank House, and the exhibits at De Niewue Kerk. The historical shopping centers at De Negen Straatjes and the Fashion and Museum District are perfect for guests who want to purchase exquisite Dutch goods. The nearby Vonderpark provides for guests a wonderful nature hideaway, should they wish to briefly escape from Amsterdam’s vibrant crowds. And with Airport Schiphol only a few kilometers away, Sofitel Legend The Grand Amsterdam offers guests a convenient location to begin their journey into this historical city. Sofitel Legend The Grand Amsterdam, a member of Historic Hotels Worldwide since 2018, dates back to 1578. In 1966, the previous Queen of the Netherlands, Queen Beatrix, got married in The Grand’s Council Chamber. This event transpired while the site served as Amsterdam’s City Hall for the final time. Accessible Rooms: An accessible room is available upon request with in-house booking. Cancellation Policy: Depends on conditions of the rate code booked. Cribs and Pack-in-Plays: Available upon request in luxury rooms; complimentary. Early Check-In/Late Check-Out: Depending upon availability. A €250 fee will be charged. Extra Person Fees: €90 per person for luxury and higher room types. Hotel/Resort Fees & Taxes: 6% VAT is included in rates, and a 6% city tax is applied on top of rates. Occupancy Restrictions: Varies by room type. The largest unit available on-property can accommodate three (3) people. Parking: 35 parking spots are available, but must be reserved in advance. Pet Policy: Small animals only, with a €25 per night fee. Rollaways: Available upon request for luxury and higher room types; a €90 fee applies. Sofitel Legend The Grand Amsterdam possesses a rich history that dates back to the 1500s. 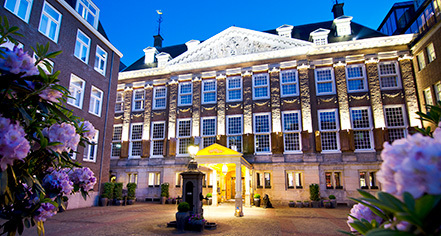 Over the centuries, the buildings that now constitute the hotel have been at different times convents, residences for European royalty, and the headquarters for the Dutch Admiralty. Learn more about the History of Sofitel Legend The Grand Amsterdam .